President Obama Honors 13 Law Enforcement Officers With Medal Of Valor : The Two-Way All of the officers were recognized for showing exceptional courage despite threats to their personal safety. President Obama presents the Medal of Valor to Officer Mario Gutierrez, of the Miami-Dade Police Department, Fla., during a ceremony in the East Room of the White House on Monday. 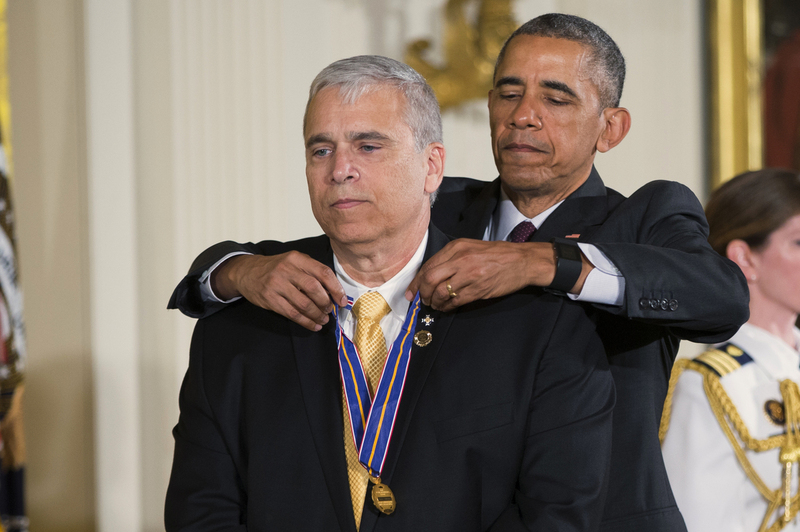 President Obama honored 13 law enforcement officers with the Public Safety Medal of Valor on Monday. All of the officers were recognized for showing exceptional courage despite threats to their personal safety. "It was your courage and quick thinking that gave us our safety," Obama said at the White House. "Although, this particular moment for which you are being honored is remarkable ... we know every day you go out there, you have a tough job." The first officer to receive the medal was Officer Mario Gutierrez of the Miami-Dade Police Department in Florida. As we reported earlier, his story begins at a gas station in Miami, where he saw a man trying to light one of the fuel tanks on fire. Gutierrez was stabbed multiple times during his struggle. But he managed to fight the man off and call for help, avoiding a big gas explosion. Perhaps the most emotional part of the ceremony came when Obama presented the medal to the grandmother of Philadelphia Police Sgt. Robert Wilson III. Wilson was killed last year when he stumbled upon an armed robbery at a video game store. Patrolman Louis Cioci (Johnson City Police Department, NY) For courageously resolving a volatile encounter with a gunman. After witnessing the murder of his fellow officer, Patrolman Cioci pursued and apprehended the gunman at a crowded hospital, thereby saving the lives of employees, patients, and visitors. Officers Jason Salas and Robert Sparks (Santa Monica Police Department, CA), and Captain Raymond Bottenfield (Santa Monica College Police Department, CA) For courage and composure in ending a deadly rampage. Officer Salas, Officer Sparks, and Captain Bottenfield placed themselves in mortal danger to save the lives of students and staff during a school shooting on the busy campus of Santa Monica College. Major David Huff (Midwest City Police Department, OK) For uncommon poise in resolving a dangerous hostage situation. Major Huff saved the life of a two-year-old girl after negotiations deteriorated with a man holding the child captive at knife point. Officer Donald Thompson (Los Angeles Police Department, CA)For courageous action to save an accident victim. While off duty, Officer Thompson traversed two freeway dividers and endured first- and second-degree burns while pulling an unconscious man to safety from a car moments before it became engulfed in flames. Officer Coral Walker (Omaha Police Department, NE) For taking brave and decisive action to subdue an active shooter. After exchanging gunfire, Officer Walker single-handedly incapacitated a man who had killed and injured multiple victims on a shooting spree. Officer Gregory Stevens (Garland Police Department, TX) For demonstrating extraordinary courage to save lives. Officer Stevens exchanged gunfire at close range and subdued two heavily-armed assailants preventing a mass shooting. Officer Niel Johnson (North Miami Police Department, FL) For swift and valorous action to end a violent crime spree. Officer Johnson pursued a man who had shot a Miami police officer and two other innocent bystanders, withstanding fire from an assault weapon, and apprehended the assailant. Special Agent Tyler Call (Federal Bureau of Investigation) For his heroic actions to save a hostage. Special Agent Call, who was off duty with his family, helped rescue a woman from her ex-husband who had violated a restraining order and held the victim at gunpoint. Deputy Joey Tortorella (Niagara County Sheriff's Office, NY) For placing himself in grave danger to protect his community. Deputy Tortorella confronted and subdued a volatile gunman who had shot and wounded his parents inside their home and by doing so prevented the gunman from threatening the safety of students at a nearby elementary school.